Each Museum Wrapped Giclee is custom printed to order and signed by Guy Harvey. Please allow 2-3 week's before this product ships. 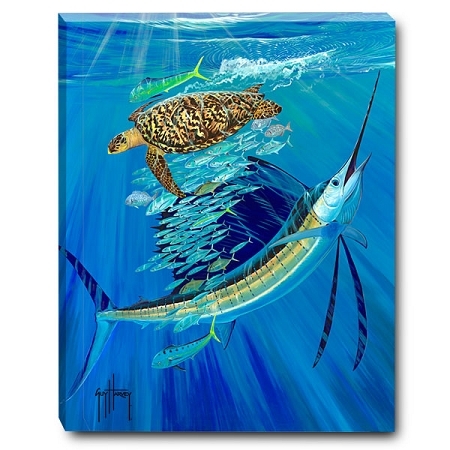 Each Guy Harvey limited edition giclee is hand signed and numbered by Dr. Harvey. Giclee is a printmaking method in which ink is sprayed on to paper or canvas using continuous tone technology, which allows us to retain all the fine detail of Guy's original art. The Touche giclee features Sailfish, a Hawksbill Sea Turtle, and Dorados. This 28" x 22", museum wrapped giclée is printed on canvas. The edition size for Touche is 200 prints. Guy Harvey (born 16 September 1955) is a Jamaican marine wildlife artist and conservationist. His depictions of sealife, especially of sportfish such as marlin, are popular with sportfishermen and have been reproduced in prints, posters, T-shirts, jewellery, clothing, and other consumer items. 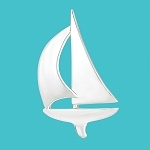 Harvey is also a very vocal and active advocate for marine conservation, having established the Guy Harvey Research Institute (GHRI) at Nova Southeastern University in Fort Lauderdale, Florida as well as the Guy Harvey Ocean Foundation, an organisation that funds scientific research and educational initiatives.